Living up to the organization’s tag line to “inspire, empower, nurture, succeed,” Boys Hope Girls Hope was founded by a Jesuit priest in 1977 to help academically capable and motivated children-in-need meet their full potential by providing them with an excellent education and a nurturing home. 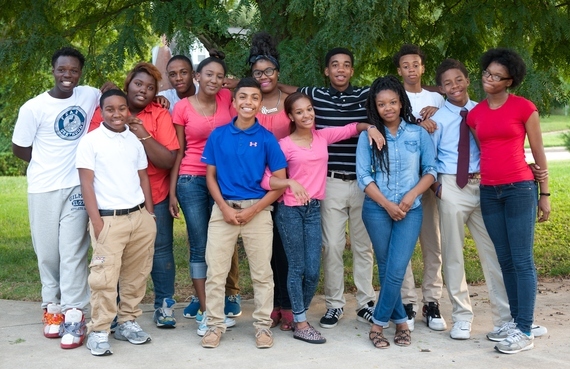 The Knott Foundation has supported their work since Boys Hope Girls Hope came to Baltimore in 2002, most recently with a grant to help pay educational expenses for their 16 scholars, including books, uniforms, field trips, and transportation. Scholars are referred to Boys Hope Girls Hope (BHGH) by teachers, guidance counselors, and social service agencies who see both potential in a child and barriers to their success, such as economic hardship, domestic abuse, or poor supervision. After extensive psycho-educational evaluations, several visits to the BHGH homes, and in close partnership with the child’s parents, the student moves in. Once a new scholar moves in, BHGH staff helps identify a private college-preparatory school in the Baltimore area that best fits the scholar’s academic needs and interests. Outside of school, scholars are encouraged to expand their horizons through service, job opportunities, sports, travel, and music. “The community service we do comes from our foundation of faith,” says Jennifer Meyerhoff, Development Director. Scholars volunteer at local nonprofits including Beans & Bread and First Fruits Farm, and they work at places like Downtown Sailing Center and WYPR. In addition, they take part in many extra-curricular activities. Joshua, a freshman at Gilman School, plays four instruments and also plays lacrosse with a program called Next One Up. A typical day at BHGH begins with a 6:00 wake-up call. All the scholars leave for school at 6:45. Dinner is at 6:30, followed by two hours of required study time. Lights are out by 9:30 for middle schoolers and 10:30 for high schoolers. While their days are highly structured, building scholars of character and compassion also comes from nurturing one another. As the oldest of five children, Noe, a junior at Calvert Hall College High School, grew up caring for his younger siblings. “Noe is now a leader among the boys in the house and takes his role as the oldest male scholar very seriously,” says Meyerhoff.